President Harding's Address at the Dedication of the Lincoln Memorial, Washington, D.C., 30 May, 1922. Washington, D.C.: Government Printing Office, 1922. The Lincoln Memorial symbolically stands on the banks of Potomac River, the border of the Union and the Confederate States during the Civil War. 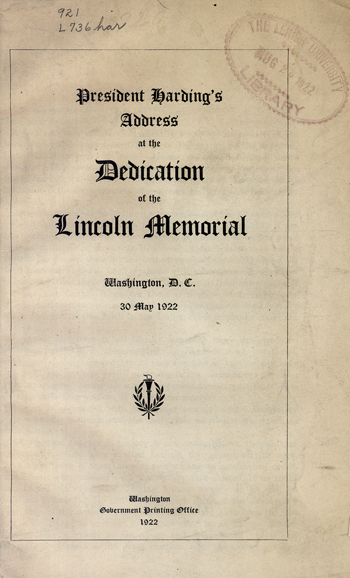 At the dedication ceremony, President Harding accepted the Memorial on the behalf of the American people and praised Lincoln as "[he] rose to colossal stature in a day of imperiled union." In February 1911, the bill to create a memorial for Lincoln was signed by President Taft, who at the dedication ceremony was the Chief Justice of the Supreme Court, appointed by President Harding. Lincoln's only surviving son was the special guest at the ceremony. Vice President Coolidge was also present.